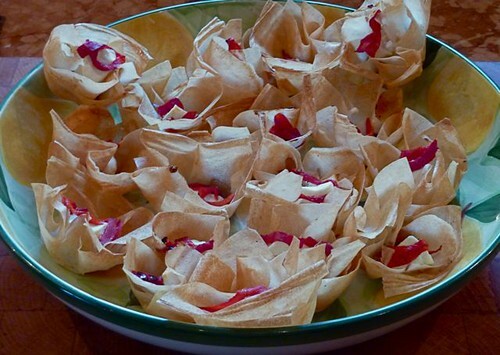 Nice little nibbles to have with drinks or as a very light starter, and very quick to make. You can use either filo or feuilles de brick for this. A large tray of them looks delightful, like a mass of flowers. Preheat the oven to 180C (160C if fan oven). Melt the butter. Take one sheet at a time of filo or brick, leaving the rest covered. Thinly brush the pastry with butter and cut into squares of about 6 cm. Press 2 squares of pastry into each hole of a mince pie tin or muffin tin, tucking it in so that it frills round the edges. Bake for 4-5 minutes till crisp but only lightly coloured. In each tart case place about a teaspoonful of onion confit and top with a slice of goat’s cheese and a small sliver of pepper or tomato. Return to the oven for another 2-3 minutes to melt the goat’s cheese slightly. They could I suppose, but they are much nicer hot or warm. They’re so quick to cook you can just prepare them in advance and pop them in the oven when needed.